Welcome to my web site. 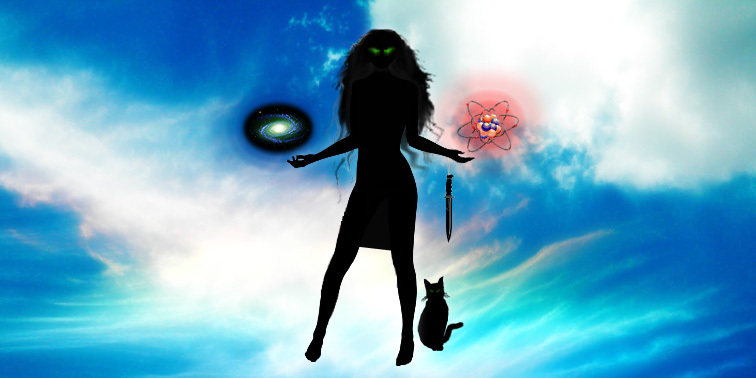 One of the pictures above (and in my profile) is a portrait of me, Fidem Turbāre, the non-existent atheist goddess, and my cat, Schrödinger (who represents a stubborn affinity for independence). Just in case you're wondering, the hunting blade dangling casually from my left wrist is a metaphor for Occam's Razor, but with a slight twist -- it's a custom design optimized for use in combat. Through my velvet gloves and conjured above my left hand is an enlarged molecule that emphasizes the analytical (details), while the galaxy conjured above my right hand emphasizes the abstract (big picture, although it's still only a miniscule part of a tiny cluster in a minor filament of the universe). As a non-existent atheist goddess, I require no worship because, very much like a shadow, I'm merely a philosophical construct who parodies mysticism, advocates for freedom, and promotes critical thinking with an emphasis on impartiality. If you find this interesting you can continue reading here. You can also send me a postcard if you'd like to show me a picture of some part of the world that's important or meaningful to you.